Over the span of more than four decades of pioneering the manufacture of Paper Machine Clothing in India, we have developed a host of new products to serve the wide spectrum of applications in Paper, Board and Newsprint industries. This has been possible because of our focus on product development based on the understanding of our end-users' specific needs. Today we have a large customer base ranging within a wide segment of paper quality from Recycled fibre to virgin pulp and from ordinary writing & printing grades to specialities, boards and newsprint. Our main focus is on consistent quality and to achieve the same we have incorporated the latest equipments from world renowned suppliers. Our quality philosophy is reflected in every stage from selection of raw materials to the most modern manufacturing facilities and always embraces the skills and competencies of employees and managers. We mainly believe and focus on the area of supplier-customer partnership to deliver superior solutions to improve their competitive advantage in today's ever-changing world. We have a dedicated team of service personnel to reach out to customers across the industry spectrum. Customers are at the core of our business and we hear their voices. 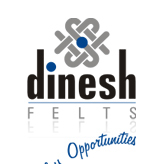 We at Dinesh believe in sustainable and long-term solutions for our clients. We feel that one of the most defining characteristic of a strong business is the existence of a symbiotic relationship between customers and suppliers cemented by the best quality product. To become a significant player in the global Machine Clothing Industry and to earn our clients’ trust through continuous improvement driven by the integrity, teamwork, and innovation. Today the machine clothing manufactured at our most modern production facility using the state of the art technologies are capable of meeting the ever changing demands of the latest, faster and wider paper machines.